Altech Chemicals Limited (ASX:ATC) (FRA:A3Y) is pleased to advise that the technical review of its Malaysian high purity alumina project that was initiated by the proposed mezzanine debt provider has now concluded. 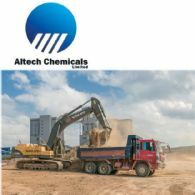 Altech Chemicals Limited (ASX:ATC) (FRA:A3Y) is pleased to announce that the Development Order for the Company&apos;s high purity alumina plant in Johor, Malaysia has been approved and that site establishment works have commenced. 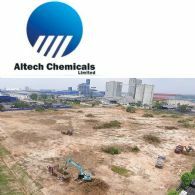 Altech Chemicals Limited (ASX:ATC) (FRA:A3Y) is pleased to announce that it has been issued a land sub-title number for its ~4Ha site in Johor, Malaysia. The receipt of the PTD has enabled the Company to now submit a development order application to local authorities in Johor for its proposed high purity alumina plant. Altech Chemicals Limited (Altech/the Company) (ASX:ATC) (FRA:A3Y) is pleased to announce that it has now finalised and "locked" the site layout and building design for its proposed Malaysian high purity alumina (HPA) plant. Altech Chemicals Limited (ASX:ATC) (FRA:A3Y) is pleased to provide an update on the numerous patent applications (pending) that it has lodged for its kaolin to high purity alumina production process, and the status of its recently granted Innovation Patent 2018101228. 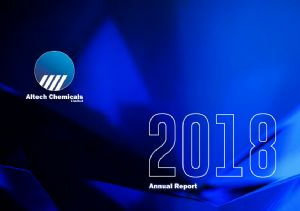 Altech Chemicals Ltd (ASX:ATC) provides the Company&apos;s Annual Report to shareholders. Altech Chemicals Limited (ASX:ATC) (FRA:A3Y) is pleased to announce that it has received the Certificate of Grant for an Innovation Patent from the Australian Patent Office, for the Company&apos;s process of producing high purity alumina from kaolin (aluminous clay). Altech originally filed the patent titled &apos;A Method for the Preparation of Alumina&apos; in October 2014. 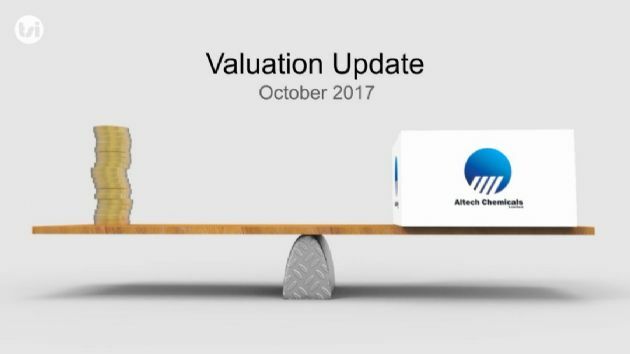 Altech Chemicals Limited (ASX:ATC) (FRA:A3Y) is pleased to provide an update on the progress of detailed project due diligence by an independent technical consultant appointed by the proposed mezzanine debt and steam facility providers. Altech Chemicals Limited (ASX:ATC) (FRA:A3Y) is pleased to provide details of recent developments and the outlook for high purity alumina demand in the lithium-ion battery sector following its attendance at BATTERY OSAKA, a three-day international rechargeable battery exhibition held in Osaka, Japan. Altech Chemicals Limited (ASX:ATC) (FRA:A3Y) is pleased to advise that a geotechnical ground drilling and survey program that commenced in mid-August 2018 at the site of its proposed high purity alumina (HPA) plant in Johor, Malaysia is well advanced and nearing completion. The securities of Altech Chemicals Limited (ASX:ATC) (FRA:A3Y) will resume normal trading on the Australian Securities Exchange this morning. Altech Chemicals Limited (ASX:ATC) (FRA:A3Y) is pleased to announce the completion of an official ground breaking ceremony marking the commencement of Stage 1 construction of its proposed high purity alumina plant in Johor, Malaysia. Altech Chemicals Limited (ASX:ATC) (FRA:A3Y) is pleased to announce that it received applications from existing shareholders for $4.3 million of new shares at an offer price of $0.165 per share under the Share Purchase Plan, which closed at 5pm (WST) on Tuesday 31 July 2018. Altech Chemicals Ltd (ASX:ATC) provides the Company&apos;s Quarterly Report. Altech Chemicals Limited (ASX:ATC) (FRA:A3Y) is pleased to announce that it has completed clearing the ~4Ha site for its proposed high purity alumina plant in Johor, Malaysia. Site clearance commenced earlier this month following the execution of the stage 1 construction agreement for the HPA plant with appointed German engineering, procurement and construction contractor, SMS group. Altech Chemicals Limited (ASX:ATC) (FRA:A3Y) is pleased to announce that it has executed a stage 1 construction works agreement with its appointed engineering, procurement and construction contractor SMS group GmbH of Germany, for the commencement of construction at its Malaysian high purity alumina plant site in Johor, Malaysia. On 9 July, Altech Chemicals Limited (ASX:ATC) (FRA:A3Y) ACN 125 301 206 announced a $20 million capital raising for commence construction of its high purity alumina plant in Malaysia. Altech Chemicals Limited (ASX:ATC) (FRA:A3Y) is pleased to announce that it has received commitments from a variety of institutional and professional investors for a share placement of ~A$17 million (before costs). Altech Chemicals Limited (ASX:ATC) (FRA:A3Y) is pleased to announce that it has signed an indicative non-binding term sheet for a US$ 60 million stream finance facility for its proposed high purity alumina project, from a US based global alternative investment group. Altech Chemicals Limited (ASX:ATC) (FRA:A3Y) is pleased to advise of the publication of a report titled "Forecast Surge in HPA Demand Driven by Lithium-ion Battery Sector". Altech Chemicals Limited (ASX:ATC) (FRA:A3Y) is pleased to announce that it has now received the official manufacturing licence from the Malaysian government for the Company&apos;s proposed 4,500tpa high purity alumina (HPA) plant in Johor, Malaysia. Altech Chemicals Limited (ASX:ATC) (FRA:A3Y) is pleased to announce that it has paid the final instalments totalling AU$5.1 million for ~4 hectares of industrial land within the Tanjung Langsat Industrial Complex, Johor, Malaysia. The final payments secure the site for the Company&apos;s proposed high purity alumina plant. Altech Chemicals Limited (ASX:ATC) (FRA:A3Y) is pleased to announce that it has received an indicative mezzanine debt term sheet for up to US$ 120 million from an international investment bank, for its proposed Malaysian high purity alumina plant and associated kaolin mine in Meckering, Western Australia. Altech Chemicals Ltd (ASX:ATC) provide the latest Company Presentation. Altech Chemicals Limited (ASX:ATC) (FRA:A3Y) is pleased to advise that its wholly owned subsidiary Altech Meckering Pty Ltd has completed the purchase of approximately 92 hectares of freehold land covering its granted mining lease M70/1334, at Meckering, Western Australia. The Directors present their report on Altech Chemicals Ltd (ASX:ATC) for the half-year ended 31 December 2017. Altech Chemicals Ltd (ASX:ATC) provides the Company&apos;s latest presentation at Australian Energy & Battery Conference. Altech Chemicals Limited (ASX:ATC) (FRA:A3Y) is pleased to provided an update on funding for its proposed Malaysian high purity alumina plant and associated kaolin mine in Meckering, Western Australia. 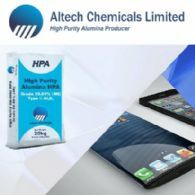 Altech Chemicals Limited (ASX:ATC) (FRA:A3Y) is pleased to announce that it has lodged a new provisional patent application with the Australian Patent Office, which incorporates the finished product HPA technology developed by it for its high purity alumina project. Altech Chemicals Limited (ASX:ATC) (FRA:A3Y) is pleased to announce that it has been advised by the Malaysian Investment Development Authority that the manufacturing licence for operation of its 4,500tpa high purity alumina plant at Johor, Malaysia has been approved. This represents another important development milestone that has been achieved by the Altech management team. Altech Chemicals Ltd (ASX:ATC) provides the Company&apos;s Presentation at Germany and USA Roadshow. Altech Chemicals Limited (ASX:ATC) (FRA:A3Y) is pleased to announce that it has executed commitment together with agreed terms and conditions from German government-owned KfW IPEX-Bank formalising the total debt package of US$190 million for its proposed Malaysian high purity alumina project. Altech Chemicals Ltd (ASX:ATC) provides the Company&apos;s Quarterly Activities and Cashflow Report for the period ending 31 December, 2017. 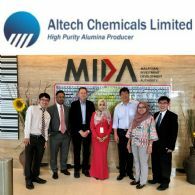 Altech Chemicals Limited (ASX:ATC) (FRA:A3Y) is pleased to announce that its wholly owned Malaysian subsidiary, Altech Chemicals Sdn Bhd has submitted a manufacturing licence application to the Malaysian Investment Development Authority (MIDA), for its proposed high purity alumina plant. Altech Chemicals Limited (ASX:ATC) (FRA:A3Y) is pleased to announce that German government owned KfW IPEX-Bank has advised the Company of credit approval for a total project finance debt package of US$190 million for its high purity alumina project. Altech Chemicals Limited (ASX:ATC) (FRA:A3Y) is pleased to announce that it has been advised that the German government inter-ministerial committee has reached a positive decision on its application for project finance export credit cover. Altech Chemicals Ltd (ASX:ATC) provides the latest Corporate Presentation. Altech Chemicals Ltd (ASX:ATC) provides Corporate Presentation at 121 Mining Investment, London. Altech Chemicals Ltd (ASX:ATC) provides the Company&apos;s Presentation at Low Emission Technology Minerals Conference. 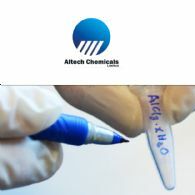 Altech Chemicals Limited (ASX:ATC) (FRA:A3Y) is pleased to announce that the board of German engineering firm SMS group GmbH has approved an additional equity investment of US$ 11 million in Altech. SMS is the lead engineering, procurement and construction contractor of the consortium appointed for construction of Altech&apos;s proposed Malaysian high purity alumina plant. Altech Chemicals Ltd (ASX:ATC) provides the Company&apos;s Corporate Presentation at International Metals Conference. 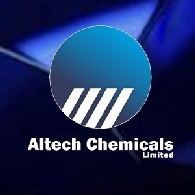 Altech Chemicals Ltd (ASX:ATC) provides the Company&apos;s Quarterly Activities & Cash Flow Report. Altech Chemicals Ltd (ASX:ATC) has announced the results of a Final Investment Decision Study (FIDS) for the development of a 4,500-tpa, High Purity Alumina (HPA) operation. This preceded the company&apos;s announcement of a successful AU$17 million capital-raising. Highlights of both announcements include the following. Altech Chemicals Limited (ASX:ATC) (FRA:A3Y) is pleased to announce that it has received commitments to raise $17.2 million (before costs) through the placement of ~122.9 million fully paid ordinary shares at an issue price of $0.14 per share to continue the development of its high purity alumina project. 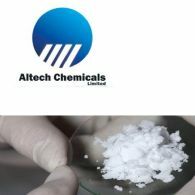 Altech Chemicals Limited (ASX:ATC) (FRA:A3Y) is pleased to announce the positive results from a Final Investment Decision Study for the development of a 4,500tpa high purity alumina plant at Johor, Malaysia and kaolin mine at Meckering, Western Australia. Altech Chemicals Limited (ASX:ATC) (FRA:A3Y) is pleased to advise that it has now finalised the design for the upgrade in capacity of its proposed Malaysian high purity alumina plant from 4,000 to 4,500 tonnes per annum. Altech Chemicals Limited (ASX:ATC) (FRA:A3Y) is pleased to announce that it has exercised its option to purchase the ~94 hectares of land at Meckering, Western Australia within which its granted and fully permitted kaolin mining lease M70/1334 lies. Altech Chemicals (ASX:ATC) (FRA:A3Y) is at an advanced stage of development for their High Purity Alumina (HPA) Project, which upon construction will be the first fully integrated HPA processing operation globally. Altech recently provided an update regarding the project&apos;s development. Altech Chemicals Limited (ASX:ATC) (FRA:A3Y) is pleased to announce that a target date of 14 December 2017 has been set for decision making for the offer of cover by the German government inter-ministerial committee, of the application for export credit project finance cover. Altech Chemicals Limited (ASX:ATC) (FRA:A3Y) is pleased to advise that its works approval application for a screening and loading facility at the Company&apos;s Meckering kaolin deposit (M70/1334) was granted by the Western Australia Department of Water and Environmental Regulation on 25 August 2017. Altech Chemicals Ltd (ASX:ATC) (FRA:A3Y) advises that as of Monday, 7 August 2017, the Company has changed its provider for shareholder registry services from Security Transfer Australia Pty Ltd to Automic Registry Services. Altech Chemicals Ltd (ASX:ATC) provides the Company&apos;s Quarterly Activities & Cash Flow Report for the period ending 30 June, 2017. Altech Chemicals Limited (ASX:ATC) (FRA:A3Y) is pleased to provide an update on the transition of engineering, procurement and construction for its proposed Malaysian high purity alumina plant, from the previously appointed EPC contractor to German engineering firm SMS group GmbH. Altech Chemicals Limited (ASX:ATC) (FRA:A3Y) is pleased to advise that German engineering firm SMS group GmbH has now completed a US$100,000 initial subscription of fully paid ordinary shares of the Company. Altech Chemicals Ltd (ASX:ATC) is pleased to announce that it has raised $1.85 million via the Share Purchase Plan, which closed on Wednesday 7 June 2017, and a concurrent placement of shares to various professional and sophisticated investors. 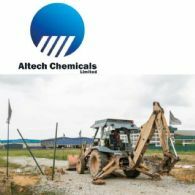 Altech Chemicals Ltd (ASX:ATC) is pleased to announce that following the unanimous approval of shareholders in a General Meeting held on 29 May 2017, the Company has now completed the $2 million placement of shares at $0.14 per share, to existing Malaysian cornerstone investor MAA Group Berhad (KLSE:MAA). Altech Chemicals Ltd (ASX:ATC) is pleased to provide a further update on due diligence activities associated with the financing of its proposed high purity alumina project. Altech Chemicals Limited (Altech/the Company) (ASX:ATC) (FRA:A3Y) advises that it has extended the Closing Date of its Share Purchase Plan (SPP) to Wednesday 7 June 2017 (5pm WST). Altech Chemicals Limited (ASX:ATC) (FRA:A3Y) advises that it has appointed German engineering firm SMS group GmbH (SMS) as the engineering, procurement and construction (EPC) contractor for its proposed Malaysian high purity alumina (HPA) plant. Altech Chemicals Limited (ASX:ATC), (FRA:A3Y) ACN 125 301 206 recently announced a $2.0 million placement of shares to existing cornerstone shareholder MAA Group Berhad. Altech Chemicals Limited (ASX:ATC) (FRA:A3Y) is pleased to advise that following the recently announced $2 million share placement to existing cornerstone investor MAA Group Berhad, the Company is now offering a Share Purchase Plan. Altech Chemicals Ltd (ASX:ATC) is pleased to provide the Company&apos;s Quarterly Activities & Cash Flow Report. Altech Chemicals Limited (ASX:ATC) is pleased to provide an update on the extensive detailed design and engineering work for its proposed Malaysian high purity alumina plant. Altech Chemicals Ltd (ASX:ATC) is pleased to announce a $2 million share placement to existing cornerstone investor, MAA Group Berhad. 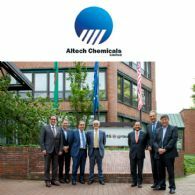 Altech Chemicals Ltd (ASX:ATC) is pleased to announce the dual listing of the Company&apos;s shares on the Frankfurt Stock Exchange. The Company&apos;s shares trade under the symbol "A3Y" on the exchange. The Directors present their report on Altech Chemicals Ltd (ASX:ATC) for the half-year ended 31 December 2016. Altech Chemicals (ASX:ATC) advises that the Department of Mines and Petroleum (WA) has approved the mining proposal and the associated mine closure plan for its Meckering kaolin deposit. The mining approval marks an important stage in the development of the Company&apos;s proposed Meckering kaolin mine, which will provide feedstock for Altech&apos;s proposed Malaysian high purity alumina (HPA) plant. 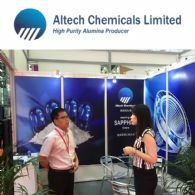 Altech Chemicals Ltd (ASX:ATC) is pleased to advise that it has reached agreement with its appointed engineering, procurement and construction contractor M+W Group on a framework for a fixed price EPC contract for the construction of the Company&apos;s proposed Malaysian high purity alumina plant. Altech Chemicals Ltd (ASX:ATC) is pleased to provide the Company&apos;s latest Presentation titled "The CEO Sessions ASX Exchange Auditorium". Altech Chemicals Limited (Altech/the Company) (ASX:ATC) is pleased to advise the initiation of coverage of the Company by The Sophisticated Investor (TSI) with the release of a research report. 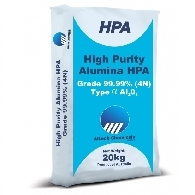 Altech Chemicals Ltd (ASX:ATC) is at an advanced stage of development for its High Purity Alumina (HPA) Project, which upon construction will be the first fully integrated HPA processing operation. Altech Chemicals Ltd (ASX:ATC) is pleased to provide an update on the due diligence activities associated with the financing of its proposed high purity alumina (HPA) project. The various independent reviews and associated confirmatory pilot plant test work are now well advanced and nearing completion. Altech Chemicals Ltd (ASX:ATC) is pleased to provide the Company&apos;s Quarterly Activities Report for the period ended 31 December, 2016. Altech Chemicals Ltd (ASX:ATC) is pleased to provide the Company&apos;s latest presentation titled "Institutional Investor Information Pack - &apos;Meeting a Sapphire Future&apos;". 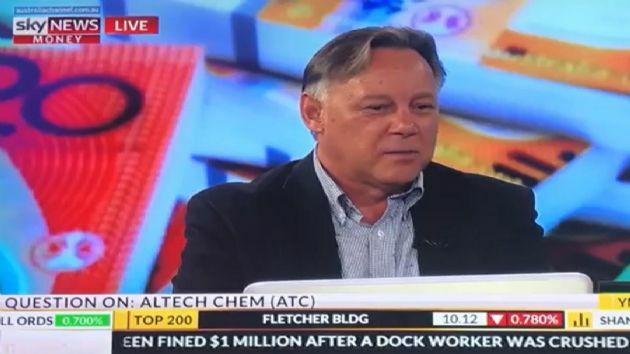 Altech Chemicals Limited (Altech/the Company) (ASX:ATC) is pleased to announce that the Company featured in a segment of "Your Money Your Call" on Sky News Money, which aired on 14 December 2016. Altech Chemicals Ltd (ASX:ATC) is pleased to advise that further to its 20 May 2016 announcement of the grant of mining lease M70/1334 at Meckering, Western Australia the Company has now submitted a mining proposal and mine closure plan to the Department of Mines and Petroleum. The submission marks the next stage of development of the Company&apos;s proposed Meckering kaolin mine, which will provide feedstock for its proposed Malaysian high purity alumina plant. Altech Chemicals Ltd (ASX:ATC) is pleased to advise the attendance of managing director Iggy Tan at the Johor Corporation official lease signing ceremony. The lease is for the land Altech has secured at the Tanjung Langsat Industrial Complex, Johor, Malaysia as the site of its proposed high purity alumina plant. 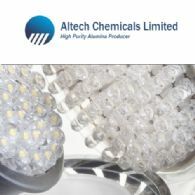 Altech Chemicals Ltd (ASX:ATC) is pleased to provide an update on the outlook for global high purity alumina demand from a report entitled "High Purity Alumina Market - Global Industry Analysis and Forecast, 2016 - 2024" by Persistence Market Research, commissioned as part of the current project debt funding due diligence program. 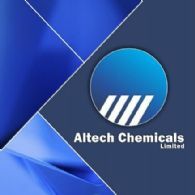 Altech Chemicals Ltd (ASX:ATC) is pleased to provide the company&apos;s latest Managing Director AGM Presentation. 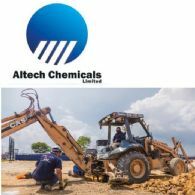 Altech Chemicals Ltd (ASX:ATC) is pleased to advise that it has commenced soil survey drilling at the site of its proposed high purity alumina (HPA) plant in the Tanjung Langsat Industrial Complex, Johor, Malaysia. 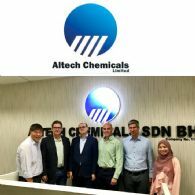 Altech Chemicals Ltd (ASX:ATC) is pleased to announce that it has opened an office for its wholly owned Malaysian subsidiary company Altech Chemicals Sdn Bhd in Johor, Malaysia. The office is conveniently located approximately 300 metres from the site of Altech&apos;s proposed high purity alumina plant in the Tanjung Langsat Industrial Complex, Johor, Malaysia. Altech Chemicals Ltd (ASX:ATC) is pleased to provide the company&apos;s Quarterly Activities and Cashflow Report for the period ended 30th September 2016. 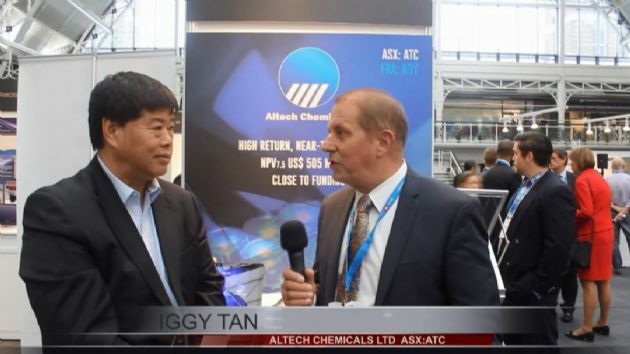 Altech Chemicals Ltd (ASX:ATC) advises that an interview featuring managing director Mr Iggy Tan was conducted at the recent TechKnow Invest conference and is now available for viewing on the Company&apos;s web site. Altech Chemicals Ltd (ASX:ATC) is pleased to provide its Company Presentation - ASX Spotlight Series Asia "Meeting a Sapphire Future". Altech Chemicals Ltd (ASX:ATC) is pleased to provide the Company&apos;s latest Presentation titled, "Meeting a Sapphire Future". Altech Chemicals Limited (ASX:ATC) is pleased to provide an update on its HPA project, which comprises the proposed construction of a 4,000tpa high purity alumina plant at Johor, Malaysia and a kaolin quarry and container loading facility at Meckering, Western Australia. Altech Chemicals Limited (ASX:ATC) announces the estimation of a maiden Ore Reserve based on the production of high purity alumina (HPA) using feedstock from its 100%-owned Meckering Kaolin Deposit (M70/1334), Western Australia. The Ore Reserve was derived from a Mineral Resources estimation at Meckering, which was delineated for the purpose of HPA production. 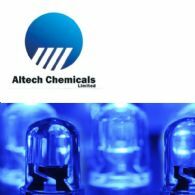 Altech Chemicals Ltd (ASX:ATC) is pleased to provide the company&apos;s Annual Report and Full Year Statutory Accounts for 2016. Altech Chemicals Limited (ASX:ATC) is pleased to provide an update on the detailed design and engineering work that is currently being undertaken by German firm M+W Group in Stuttgart, Germany, for its proposed Malaysian high purity alumina (HPA) plant. 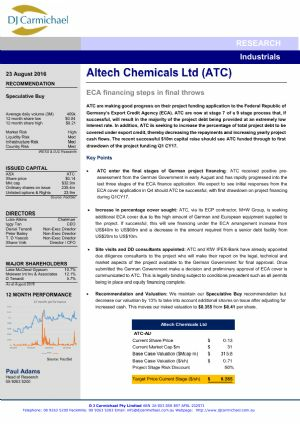 Altech Chemicals Limited (ASX:ATC) is pleased to advise of the release of an updated research report titled "ECA financing steps in final throws" by Perth-based stockbroking firm DJ Carmichael. Altech Chemicals Limited (ASX:ATC) is pleased to announce that the Company has received a summary of senior facility agreement indicative terms and conditions from German government-owned KfW IPEX-Bank for the proposed US$70 million of debt financing of its Malaysian high purity alumina (HPA) project. Altech Chemicals Limited (Altech/the Company) (ASX:ATC) is pleased to announce that the Company&apos;s targeted debt financing for its proposed Malaysian high purity alumina (HPA) project has increased to US$70 million (previously US$60 million). Altech Chemicals Limited (Altech/the Company) (ASX:ATC) is pleased to provide an important update on the progress of financing for its proposed high purity alumina (HPA) project. Altech Chemicals Limited (ASX:ATC) is pleased to report that it has been officially advised by Euler Hermes Aktiengesellschaft, the German Export Credit Agency, of a positive preassessment by the German Government inter-ministerial committee and Hermes, of Altech&apos;s export credit project finance application for cursory review. Altech Chemicals Limited (ASX:ATC) has welcomed a number of institutional investors onto its share register as a result of a AU$10 million oversubscribed share placement. Placement shares will be issued at 14 cents per share, which represents a 14% discount to the price of the Company&apos;s shares at the close of trade on the Australian Securities Exchange (ASX) on 21 July 2016. Altech Chemicals Limited (ASX:ATC) advises that further to the suspension in trading of the Company&apos;s securities on the Australian Securities Exchange (ASX) pre-open this morning. Altech Chemicals Limited (Altech/the Company) (ASX:ATC) is pleased to provide a summary of its recent attendance at the 2nd International Sapphire Industry and Touch Screen Technology Exhibition in Shenzhen, China (June 23-25 2016). Following the completion of grade control drilling in April 2016, Altech Chemicals Limited (ASX:ATC) is pleased to announce an update to kaolin mineral resources for its 100%-owned mining lease (ML) M70/1334, at Meckering Western Australia. Altech Chemicals Limited (ASX:ATC) is pleased to provide a revised copy its presentation for the 3rd International Sapphire Industry Technology Exhibition (Sapphire Expo) in Shenzhen, China. 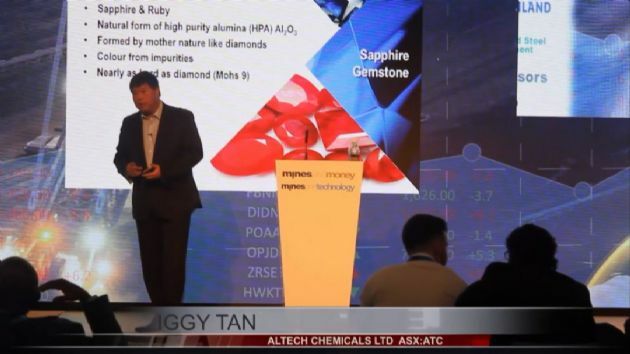 Altech Chemicals Limited (ASX:ATC) is pleased to provide a copy of the presentation that will be delivered by Company General Manager Operations, Mr Jingyaun Liu at the 3rd International Sapphire Industry Technology Exhibition (Sapphire Expo) in Shenzhen, China on Thursday, 23 June 2016. Following its 3 June 2016 announcement regarding the strong interest shown in Altech Chemicals Limited (ASX: ATC) as an emerging high purity alumina (HPA) producer during the 12th China International Battery Fair, the Company is pleased to present its 10-year forecast of global demand for HPA used in the lithium-ion battery manufacturing sector. Altech Chemicals Limited (Altech/the Company) (ASX:ATC) is pleased to announce that it has secured another quality cornerstone investor, MAA Group Berhad (MAAG), which will subscribe to $1.0 million of Altech shares (March 2016 placement shares). Altech Chemicals Limited (Altech/the Company) (ASX:ATC) advises that an interview with chief financial officer and company secretary, Mr Shane Volk was recently conducted by Canary Networks and is now available for viewing. 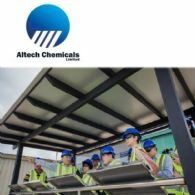 Altech Chemicals Ltd (ASX:ATC) are pleased to provide an Interview with Managing Director Iggy Tan. Altech Chemicals Limited (Altech/the Company) (ASX:ATC) is pleased to confirm the receipt of $1.75 million, being the balance of proceeds from the sale of its Meckering exploration licence E70/3923 to Dana Shipping and Trading S.A. (Dana). Altech Chemicals Limited (ASX:ATC) is pleased to announce that its kaolin mining lease (ML) application M70/1334 at Meckering, Western Australia has been granted by the Department of Mines and Petroleum. Altech Chemicals Limited (ASX:ATC) is pleased to confirm that a minute of consent order has been filed in the Supreme Court of Western Australia, consenting to the discontinuation of legal proceedings between Dana Shipping and Trading S.A. (Dana) and Altech. Altech Chemicals Limited (ASX:ATC) is pleased to announce that it is featured in a research report titled "Excellent Progress on the Finance and Offtake Front" by Breakaway Research. Altech Chemicals Limited (ASX:ATC) is pleased to announce that it has executed an agreement with Dana Shipping and Trading S.A. for the sale of exploration licence E70/3923 (excluding mining lease application M70/1334, owned by Altech) at Meckering, Western Australia for $2.0 million. Altech Chemicals Ltd (ASX:ATC) are pleased to provide the Company&apos;s Quarterly Activities and Cashflow Report for March 2016. Altech Chemicals Limited (ASX:ATC) is pleased to announce that it has executed a 10 year off take sales arrangement with Mitsubishi Corporation&apos;s Australian subsidiary, Mitsubishi Australia Ltd for 100% of the high purity alumina (HPA) production from the Company&apos;s proposed Malaysian HPA plant. Altech Chemicals Limited (ASX: ATC) advises that its Share Purchase Plan (SPP) has now closed. The Company is delighted with the support for the SPP. A total of $744,000 was raised from the 250 shareholders that participated. Altech Chemicals Limited (ASX:ATC) reminds shareholders that the closing date for applications for additional shares under its current Share Purchase Plan (SPP) is 5pm (WST) Friday 8 April 2016. There will be no extension to the closing date. Altech Chemicals Limited (ASX:ATC) is pleased to announce that it has commenced a grade control drilling program at its Meckering kaolin deposit. Altech Chemicals Ltd (ATC:AU) would like to offer to existing shareholders the opportunity to purchase additional shares in the Company at the same price as the price paid by the professional and sophisticated investors, i.e. 8.6 cents per share. Altech Chemicals Limited (ASX:ATC) is pleased to advise that it has raised $1.2 million via a placement of shares to a variety of professional and sophisticated investors at 8.6 cents per share. Altech Chemicals Limited (ASX:ATC) is pleased to provide an update on the debt funding activities for its high purity alumina (HPA) project following a meeting with KfW IPEX-Bank in Stuttgart, Germany on 17 March 2016. 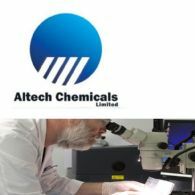 Altech Chemicals Limited (ASX:ATC) advises that further to the suspension of the trading of its securities on the ASX pre-open this morning, Perth stockbroking firm DJ Carmichael Pty Ltd is co-ordinating a placement of fully paid ordinary shares of the Company to a variety of professional and sophisticated investors. Altech Chemicals Limited (ASX:ATC) has formally appointed M+W Group as its Engineering, Procurement and Construction (EPC) contractor for its high purity alumina (HPA) project. Altech Chemicals Limited (ASX:ATC) is pleased to announce the results of an update to its Bankable Feasibility Study for the development of a 4,000tpa high purity alumina (HPA) processing plant at Johor, Malaysia. The Directors present their report on Altech Chemicals Ltd (ASX:ATC) for the half-year ended 31 December 2015. Altech Chemicals Limited (ASX:ATC) is pleased to announce that it has finalised a lease agreement with Johor Corporation for a ~4Ha plot of land in the Tanjung Langsat Industrial Complex, Johor, Malaysia as the site for its proposed high purity alumina (HPA) plant. Altech Chemicals Limited (ASX:ATC) is pleased to announce that it has featured in an &apos;initial coverage&apos; research report titled "Unique opportunity in high-tech chemicals" by DJ Carmichael, which has been released today. Altech Chemicals Limited (ASX:ATC) is pleased to provide further information on the fast growing utilisation of high purity alumina (HPA) in lithium-ion batteries. Altech Chemicals Ltd (ASX:ATC) announce the Quarterly Activities and Cashflow Report for the period ending December 2015. 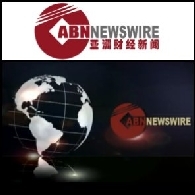 Altech Chemicals Ltd (ASX:ATC) is pleased to announce the appointment of Mr Martin Ma as the Company&apos;s sales and marketing manager (China). This key appointment marks an important step as the Company progresses its marketing strategy for the high purity alumina (HPA) project specifically for the Asia Pacific region. 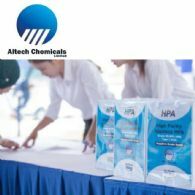 Altech Chemicals Limited (ASX:ATC) is pleased to announce the release of a Corporate Video that provides a useful overview of the various applications of High Purity Alumina (HPA) and the Company&apos;s proposed HPA project at Johor, Malaysia. Altech Chemicals Ltd (ASX:ATC) is pleased to report that following a recent presentation to Euler Hermes Aktiengesellschaft ("Hermes") in Hamburg, Germany and its preliminary evaluation of the Company&apos;s proposed high purity alumina project, Hermes has issued a Letter of Interest confirming in principle support under the export credit insurance guarantee scheme of the Federal Republic of Germany. Altech Chemicals Limited (Altech/the Company) (ASX:ATC) advises that exploration licence E70/4718 (Kerrigan project) has been granted. The licence covers an area of approximately 480km2, is on freehold agricultural land and contains Inferred Kaolin Mineral Resources of 85 million tonnes at 85.1% brightness. Altech Chemicals (ASX:ATC) is pleased to advise that it has executed an exclusive mandate with German KfW IPEX-Bank GmbH, to provide advisory and structuring services in relation to the provision of senior debt project financing for the Company&apos;s proposed high purity alumina project. Regeneus (ASX:RGS), a clinical-stage regenerative medicine company, announced today the commencement of a trial of its cancer vaccine technology, Kvax, in combination with chemotherapy as a treatment for canine lymphoma. Altech Chemicals Limited (ASX:ATC) is pleased to provide an update on the detailed design work that is currently underway for its proposed high purity alumina (HPA) project. Altech Chemicals Limited (ASX:ATC) is pleased to provide an update on the progress of financing activities for its proposed high purity alumina project (HPA Project). Altech Chemicals Limited (Altech/the Company) (ASX:ATC) presents the quarterly activity report for the three months ended 30 September 2015. Altech Chemicals Limited (ASX:ATC) advises that it has reached agreement with Dana Shipping and Trading S.A. (Dana) to grant Dana the exclusive right to mine up to 10Mt of kaolin from the Company&apos;s Meckering kaolin deposit. 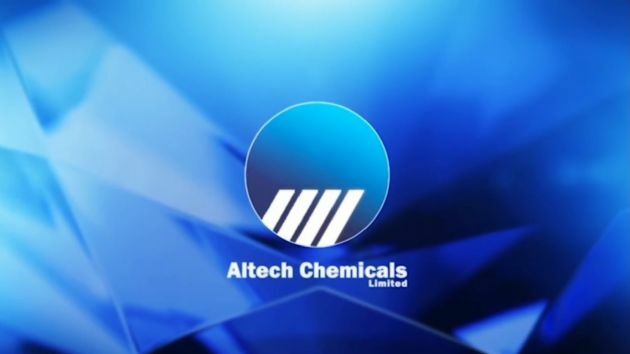 Altech Chemicals Limited (ASX:ATC) is pleased to advise that it has appointed His Royal Highness Prince Ya&apos;acob Bin Tunku Tan Sri Abdullah, as a non-executive director to the Altech Chemicals Limited Board, and that the Prince has nominated Mr Uwe Ahrens as his alternate. Altech Chemicals Limited (ASX:ATC) is pleased to advise that Melewar International Investment Company Limited (Melewar) has now completed the second tranche of its share placement in the Company, following approval by shareholders at the Company&apos;s Annual General Meeting on 15 October 2015. Altech Chemicals Limited (Altech/the Company) (ASX:ATC) advises that the extension of the Dana Shipping and Trading S.A. (Dana) bulk kaolin option exercise period announced on 1 October 2015 has now lapsed. 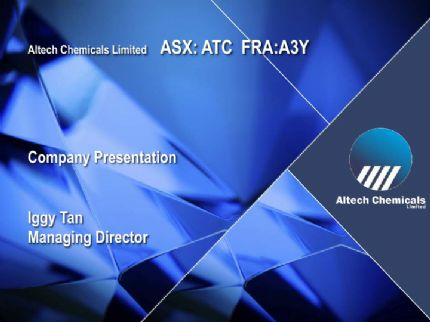 Altech Chemicals Limited (Altech/the Company) (ASX:ATC) is pleased to make available to shareholders a Company presentation by managing director, Mr Iggy Tan at the Melbourne Resource Round Up on 1 October 2015. 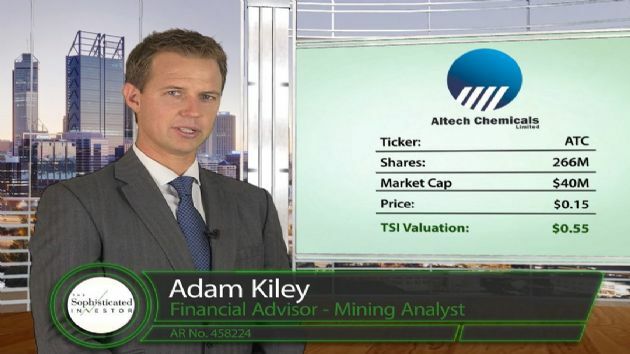 Altech Chemicals Limited (ASX:ATC) advises that an interview by Finance Network News was recently conducted with managing director, Mr Iggy Tan and is now available for viewing. Altech Chemicals Limited (ASX:ATC) is pleased to announce that it has now secured land in the Tanjung Langsat Industrial Complex, Johor, Malaysia for its proposed high purity alumina (HPA) plant. Altech Chemicals Limited (ASX:ATC) has signed a sales and distribution agreement with Mitsubishi Corporation&apos;s Australian subsidiary, Mitsubishi Australia Ltd for its proposed high purity alumina product. Altech Chemicals Ltd (ASX:ATC) is pleased to announce the appointment of Dr Jingyuan Liu as General Manager Operations for its high purity alumina (HPA) project. This key executive appointment marks an important step as the Company progresses its HPA project to detailed plant design and subject to funding preparations for construction. Altech Chemicals Ltd (ASX:ATC) are pleased to provide its Annual Report and Financial Statements for 2015. Altech Chemicals Ltd (ASX:ATC) Breakaway Research Report "Robust PFS Driving a New Age Materials Boom"
Altech Chemicals Ltd (ASX:ATC) is pleased to announce that it is featured in an &apos;company update&apos; research report commissioned by the Company titled "Robust BFS Driving a New Age Materials Boom" by Breakaway Research, which has been released today. Altech Chemicals Limited (ASX:ATC) is pleased to advise that it will raise a total of $1.130 million via share placement, for the commencement of detailed design work for the Company&apos;s high purity alumina (HPA) project and for corporate and general working capital purposes. Altech Chemicals Limited (Altech/the Company) (ASX:ATC) presents the quarterly activity report for the three months ended 30 June 2015. 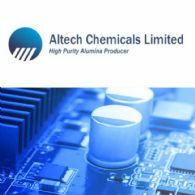 Altech Chemicals Limited (ASX:ATC) is aiming to become a world leading producer of 99.99% (4N) high purity alumina (HPA) (Al2O3). Altech Chemicals Limited (ASX:ATC) is pleased to announce that it has submitted a project application with the Western Australian Department of Environment Regulation (DER) as part of the permitting requirements for its proposed aluminous clay (kaolin) mine and associated beneficiation plant, at Meckering, Western Australia (the Project). Altech Chemicals Limited (ASX:ATC) is delighted to announce the positive results of its Bankable Feasibility Study (BFS) for the development of a 4,000tpa high purity alumina (HPA) processing plant at Tanjung Langsat, Johor, Malaysia and an associated kaolin beneficiation plant at Meckering, Western Australia to provide feedstock for the HPA plant (the Project). Altech Chemicals Limited (ASX:ATC) is pleased to announce that it has signed a Memorandum of Understanding (MOU) with leading kiln system supplier Drytech International (Drytech) for its high purity alumina (HPA) project. Altech Chemicals Limited (ASX:ATC) is pleased to announce that it has received approval from the Department of Environment, Johor of its Preliminary Site Assessment for the construction and operation of its proposed high purity alumina (HPA) processing plant at Tanjung Langsat, Malaysia. 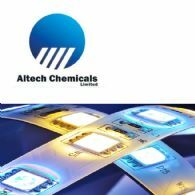 Altech Chemicals Ltd (ASX:ATC) announce the Company Presentation to the Gold Coast Investment Showcase. 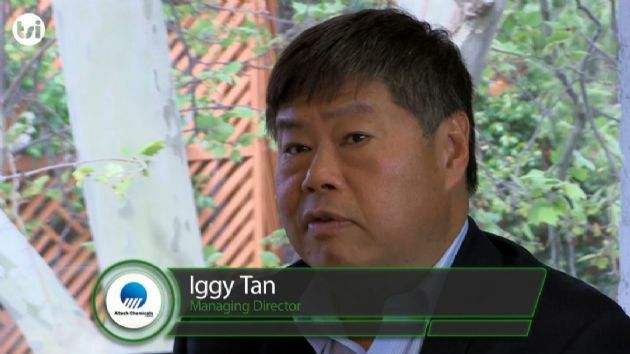 Presented by Iggy Tan, Managing Director. Altech Chemicals Limited (ASX:ATC) is pleased to announce that it has signed a Memorandum of Understanding with SGL Group as its partner for the supply and installation of the Hydrochloric Acid gas generation, absorption, recovery and scrubbing plants for it&apos;s high purity alumina project. Altech Chemicals Limited (ASX:ATC) is pleased to announce that it has now appointed Simulus Engineering Pty Ltd as its Engineering, Procurement, Construction and Management partner for its proposed kaolin beneficiation plant at Meckering, Western Australia. 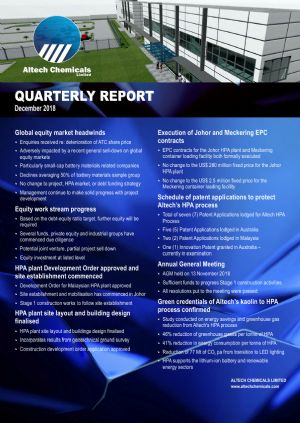 Altech Chemicals Ltd (ASX:ATC) announce the Quarterly Activities and Cash Flow Report for the period with significant highlights. Altech Chemicals Limited (ASX:ATC) is pleased to announce that it has signed a Memorandum of Understanding with Malaysian engineering and construction group Melewar Integrated Engineering Sdn Bhd, appointing it as construction contractor for Altech&apos;s proposed high purity alumina processing plant in Johor Bahru, Malaysia. Altech Chemicals Limited (ASX:ATC) is pleased to announce that it has commenced the permitting process for its high purity alumina processing plant proposed to be located in the Tanjung Langsat Industrial Park, Johor Bahru, Malaysia. 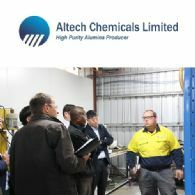 Altech Chemicals Limited (ASX:ATC) is pleased to announce that it has signed a Memorandum of Understanding with mining services company, Castle Equipment Pty Ltd, appointing it as mining contractor and processing plant operator for the Company&apos;s aluminous clay deposit at Meckering, Western Australia. Altech Chemicals Limited (ASX:ATC) is pleased to advise that it has entered into a short-term debt-based instrument that provides the Company with immediate funds equivalent to its forecast research and development tax incentive offset for the year ended 30 June 2015. Altech Chemicals Limited (ASX:ATC) is pleased to announce that it has signed a Memorandum of Understanding with Atea Environmental Group appointing it as the partner for the supply of dual-laminate anti-corrosive composite plant and equipment for Altech&apos;s proposed high purity alumina plant. 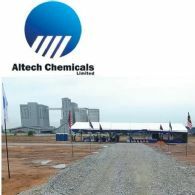 Altech Chemicals Limited (ASX:ATC) is pleased to announce that following its strategic decision to select Johor Bahru, Malaysia as the preferred location for its proposed 4,000tpa high purity alumina processing plant, it has now appointed M+W Group as its Engineering, Procurement, Construction and Management partner. Altech Chemicals Limited (ASX:ATC) is pleased to announce that it has executed a Memorandum of Understanding to appoint Sea Transport Management (W.A.) as the exclusive transport and logistic services provider for the Company&apos;s proposed high purity alumina operation. Altech Chemicals Ltd (ASX:ATC) announce the Quarterly Activities and Cash Flow Report for the period ending December 2014 with significant highlights. Altech Chemicals Limited (ASX:ATC) is pleased to announce that as part of the current Bankable Feasibility Study (BFS) for its high purity alumina (HPA) project, it has optimised the proposed beneficiation process for the Meckering aluminous clay (kaolin) deposit. Altech Chemicals Ltd (ASX:ATC) is pleased to announce that following its strategic decision to select Johor Bahru, Malaysia as the preferred location for its proposed high purity alumina (HPA) processing plant, it has now incorporated a wholly-owned Malaysian subsidiary company, &apos;Altech Chemicals Sdn Bhd&apos;. Altech Chemicals Limited (Altech/the Company) (ASX:ATC) advises that it has extended the Closing Date of its pro-rata non-renounceable Entitlement Offer to Eligible Shareholders to Friday, 19 December 2014. Altech Chemicals Limited (Altech/the Company) (ASX:ATC) is pleased to announce that it has selected the Tanjung Langsat Industrial Park in Johor Bahru (JB), the capital city of Johor state, Malaysia, as the preferred location for its proposed high purity alumina (HPA) processing plant.